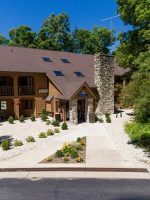 This Great Lakes resort with cottage-style architecture feels more East Coast than Midwest with ships coming into harbor, blasts of boat horns, the cry of seagulls, Door County’s Maritime Museum and a charming downtown for shopping and dining. It’s all within a stroll — or stroller ride — from the resort, making it a relaxing place to base a Lake Michigan getaway. Toddlers have their own small slide and splash area near the indoor pool. Older children can splash around the indoor pool with its nautical theme while adults kick back in the hot tub. When the weather’s sunny, there’s a deck with faux rock and a waterfall next to the outdoor pool. 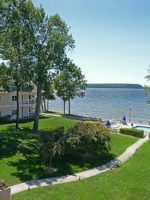 Resort rooms feel like a new vacation home with small kitchens or wet bars and microwaves that let you eat at your leisure and take advantage of Door County’s bounty. Make time to find fruit stands with strawberries, cherries and apples, and farm markets with cherry pies, cherry brats, juices, ciders, jams and even cherry salsa. For Moms and Dads, there are several wineries, too, and a few cheese shops with some of Wisconsin’s best cheeses. Families traveling with a group of relatives or friends can gather in the spacious lobby area that faces the harbor for their own meals or visiting with complimentary coffee, cappuccino, tea and juices all day long. There’s a cupboard full of games that guests can use. 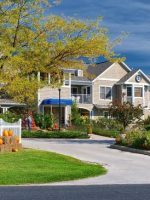 It’s a homey resort choice whether you stay put or hit the road to explore the rest of Door County for great beaches, state parks, orchards, art studios and boutique shopping. The good news for families is that all rooms include at least a microwave and mini refrigerator, which is great for kids who won't eat on schedule (like when you're out to eat) or don't sit still for restaurant dining. Each suite includes a 37-inch flat-screen TV, a DVD player and cable TV, free Wi-Fi and air conditioning. If there's a rare heat wave, the balconies can get hot as A/C fans blow onto them. The Marion and Falcon rooms with king beds (the Falcon is more spacious) have space for a couple and a portable crib. The Badger and Spartan suites sleep four people with one bedroom and a sleeper sofa. Each has a full kitchen. Challenger suites have the added amenities of a covered balcony and double-facing fireplaces. Suites have water views or a large whirlpool. 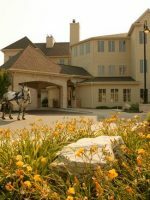 The Firebird, Griffin and Brunswick suites include two bedrooms with a sleeper sofa, master bath with whirlpool, kitchen and two covered balconies. The Westchester has the best water views and includes two whirlpools and a fireplace; these sleep up to six people. The Utopia suite sleeps up to eight people with three private bedrooms, three baths, a sleeper sofa, fireplace, kitchenette, and three balconies. My family and I stayed at Bridgeport for 2 nights over spring break. My husband and I both live and work in this community. I own a small business and my husband is a chef. Upon check in we noticed a variety of cleanliness issues beyond a usual "overlooked item", which is very common and would never upset me. I was a housekeeper for nearly 15 years so I know accidents occur. However, upon further inspection, there were an incredible number of unacceptable issues. There were many other small issues that we did not photograph. Despite our "luxury suite" not meeting our cleanliness expectations, we decided to spend less time in our room and more time throughout the resort, making use of the amenities included with our stay. Our first stop was the snack shop, which provided only a handful of overpriced snacks and wine. The juice machines were all out of order. All of the board games were missing pieces. I can understand those issues, being the off-season. So we moved on to the kids play area. Utter dismay. A large majority of the games didn't function correctly, "eating" coins. The games that were functioning properly were poorly kept and dirty. Every game was filthy. The entire space was in disrepair. While I understand it is a children's space and will be covered in fingerprints- I believe your guests expect more from a resort that boasts they are "The Best in Door County Lodging". The pool area was also in disrepair. The emergency exit door frame had rotting wood, there were numerous rusty places in the pool area, and the bathrooms were very poorly kept. I will add a note that the front desk associates were very friendly and helpful. All-in-all we did not enjoy our stay at your resort. Even at the off-season rate, we were provided, I believe our stay fell very short of our expectations. For the amount of money, we spent we could have stayed at any place in Door County, and beyond. Our family goes on one trip a year, and this year was disappointing, especially to parents of young kids who spent nearly $500 on their room alone. We shared our experience via email with the GM, and received no response. We stayed at Bridgeport in September 2018. The property is beautiful and the rooms are nice. The reason I said that they are lacking in customer service is this. For coffee, they offered Styrofoam cups with plastic lids that did not work well. They did not "snap" on. In order for the lid to be on tightly, I had to press down little by little all around the lip of the cup. I guess I missed a spot, so when I took a drink, scalding hot coffee poured all over my chest. I went to the front desk and told the manager that I had burned my chest and advised that the lids did not fit well. The manager just said, "They do fit," and proceeded to press the lid down little by little to show me. Her reply was totally inadequate! There was no "I'm sorry that happened" or "We'll certainly look into that. Our apologies." She basically was saying, "You're wrong, and I really don't care that you got burned." So here I am 3 months later still seeing the burn scars on my chest and thinking that some day the same thing will happen to another customer who won't be so forgiving. It's easy to kick back and relax at the resort. Favorite family activities include a game of water basketball in the big pool, watching little ones in the mini water park, cooling off beneath a waterfall or soaking up summer sun in the outdoor pool, playing games in the lobby with views of the harbor along with free java and juices, challenging each other to air hockey in the arcade, losing little ones in the ball pit at Peabody's Playpark and checking out complimentary movies to watch in your suites. Walk on over (it's right next door) and let your kids dress up as pirates as they explore the "Ship to Shore" exhibit and pose for photos. The exhibits explain a pirate's life, dangers on the sea and pirate gold. Kids can climb aboard a ship, swab the deck, take virtual cannon shots at enemies and use their noses to identify mystery smells. The exhibit should run through 2014. There also are other maritime exhibits in this museum, including a restored bright-red tugboat in the harbor out front. Sturgeon Bay has an easy-to-explore downtown across the bridge near the resort. You'll find plenty of fun boutiques, mostly along Third Avenue/County Road B. The kids' favorite stops will likely be Door County Candy Company (for its 16 ice cream flavors, gourmet popcorn, 150 kinds of salt water taffy, nostalgic candy and chocolates from sweet chocolate-covered cherries to salty chocolate-covered bacon); Child's Play (for whimsical kids' clothing, games, toys and shower gifts; and Dancing Bear (for its extensive line of building blocks, stuffed animals, trains and books). You can get a few food items in the resort store and fruit in the morning, but there is no onsite cafe or restaurant. Fortunately, though, you can call for delivery, stock up on local fruits and cheeses and find several great restaurants within walking distance or a few-minute drive. Only a two-block stroll from the resort, this cafe keeps foodies happy with creative, eclectic salads, sandwiches and entrees and a fun, artsy vibe that's casual (and affordable) enough for families. Moms and dads can savor sandwiches like a Muffaletta, salads with cherry balsamic dressing, entrees such as tempura shrimp and cherry barbecue ribs, and vegetarian entrees such as a creamy garlic, corn and Poblano lasagna. The kids' menu includes a munchie plate with ham, cheese, fruit, carrots and veggie straws. Door County Coffee & Tea is best known as the biggest hub for locally roasted and flavored coffees. There's also a drive-thru for speedy caffeine fixes, but stop in for a tasty breakfast with a huge variety of pastries, a hash brown bake, quiche and strata. For lunch, there are sandwiches such as turkey with cranberry chutney, soups, and a Door County salad with dried cherries, roasted walnuts and cherry vinaigrette. Grabbing a bag of squeaky-fresh cheese curds is a must on Wisconsin vacations. At this shop, seven miles south of Sturgeon Bay (and on the way to Bridgeport), you can also try one of the flavored cheddars for poolside snacks. They may be flavored with olives, maple syrup, cherries or Door County wines. If you prefer something more classic, pick up Colby cheese and summer sausage for a picnic, along with dried cherries for munching. 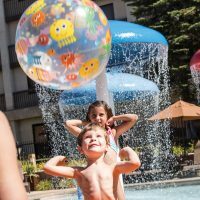 Ask if rooms are ready early if your kids are eager to hit the pools, or assure them they can eke out an extra morning of swimming with an 11 a.m. checkout. Younger kids get a gift bag at check-in with a Door County coloring book, crayons and other trinkets. Room rates are based on a two-person occupancy with an extra per person fee for ages 13 and up. Pack 'n Play cribs are available for a nightly fee. If kids are squirrely after a day of traveling or up too early for the pool's 8 a.m. opening, grab the walkway in front of the resort that follows the waterfront and go explore. The walkway connects to Otumba Park with a beach, playground, basketball hoops and tennis courts. Basketballs and racquets are available at the front desk. If you're on a budget, go for one of the bigger suites and share the costs with another family or relatives. You can take turns with meal duties, too. There are grills outside for summer cookouts and picnics overlooking the harbor. Family Fun Packages and additional packages are offered throughout the year such as a bundled golf special at the Idlewild course in the fall, a three-night family getaway for New Year's Eve with a special kids' party and breakfast, and a Memorial Day weekend with free hors d'oeuvres, food coupons for the town's art fair and a supervised kids' arts-and-crafts party. A small market near the check-in desk sells sundries including sunscreen, bath salts and toiletries, along with a few food and snack items like frozen pizza, ice cream treats and beverages. You can buy wine and champagne from the front desk. There are also grocery and discount stores in Sturgeon Bay. The city of about 10,000 residents is the largest in Door County and the last place you'll see a chain restaurant before driving north on the peninsula. Early summer can still be cool temperature-wise, but rates are more affordable. Rates jump up around the Fourth of July weekend and mid-July through early August. The last two weekends in August also are more affordable. May is considered off-season (often with big price drops), which can be nice for a weekend pool getaway and to see the orchards in bloom. You can fly into Green Bay's Austin Straubel International Airport and rent a vehicle for the 50-minute drive east on Highway 57 to Sturgeon Bay. 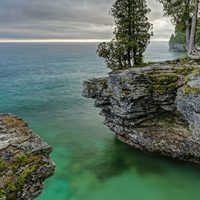 However, most Door County travelers road-trip to the peninsula, which is 230 miles from Chicago via I-94 and I-43, 144 miles from Milwaukee on I-43, 180 miles from Madison via Highway 151 and Highway 41, and 310 miles from Minneapolis via I-94 and Highway 29. Once you enter Sturgeon Bay, pass through two traffic lights, and then exit right on the Business District. Follow this road (Madison Avenue) through one more traffic light, then turn left on Larch St. before the bridge. A vehicle would be needed to explore much of Sturgeon Bay. For downtime, play a round on the Idlewild Golf Club or sign up for a couples massage at Saguaro Day Spa in Sturgeon Bay. Saguaro's offers Swedish, stone, prenatal and Ayurveda massage. For a date-night, head to historic Inn at Cedar Crossing for one of the city's best dinners.